Scherezade arose from my love of India and following an inspirational trip to an exhibition, ‘Shamiana The Mughul Tent’, at the V&A in 1999. The exhibition showed large scale textile panels created by women’s groups around the UK. These panels depicted a myriad of images and stories from women’s lives and memories. 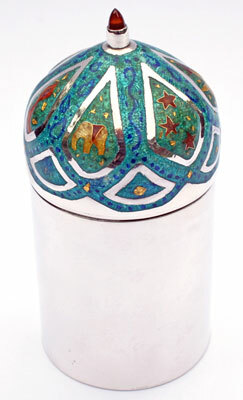 My box comprises a silver container with a bayonet clasp for an enamelled lid in the form of a dome. The box as a whole is reminiscent of Moghul architecture, and the dome depicts a series of snapshots that reminded me of my visits to India. 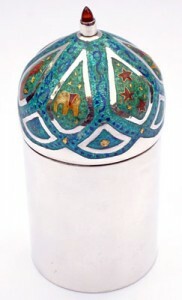 The enamelling is a combination of champlevé enamel with cloisonné detail and fine gold foils. The lid is topped by a finial of a bezel set, bullet shaped carnelian. The box is approximately 95mm high.